Over the last few weeks I’ve been working quite intensively with Railo. And over that period I’ve been migrating a lot of my current applications to Railo. The migration process has been relatively painless and that is really impressive. There are two things to look out for: compile-time errors and runtime errors in the code that you migrate. Railo makes it really easy to uncover compile-time errors. It provides a setting in the Web Administrator that goes off and compiles all the cfm and cfc pages in your application. Imagine if your application has a lot of cfm and cfc files. How complex would it be to test if all of them work ok or not. Checking for compile-time errors is important as Railo is slightly less forgiving than the Adobe ColdFusion compiler. The Railo compiler verifies tags, attributes, arguments in a little more strict manner — which I think is a positive thing. Not only does it help to keep the code sharp, but also leads to gains in performance. So to test for compile-time errors, without having to physically click through each cfm page in your application or instantiating each cfc, you can simply setup a mapping in the Server Administrator to the folder where your application lives. Once the mapping is setup, simply go to edit the mapping and hit the compile button. 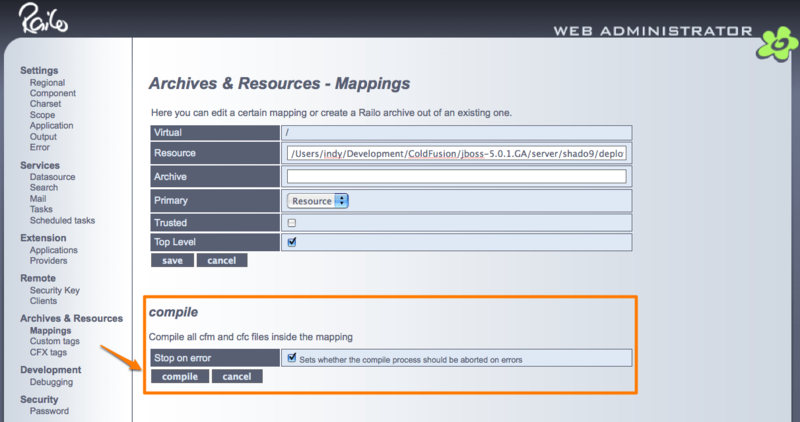 Railo goes through all the cfm and cfc files, compiles them, and reports on any errors it finds.